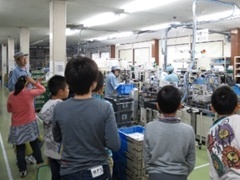 Miyamoto welcomes local elementary school students for factory tours to provide opportunities for social studies. We offer local high school students opportunities to complete a period of work experience every year. 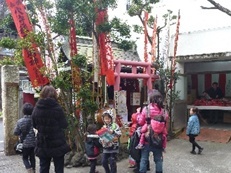 We invite children to an altar in the premise of Miyamoto’s Tokyo Office, where "Oinari-sama", the Japanese god of foxes, is enshrined, and give them snacks and candy, praying for their good health and community development. 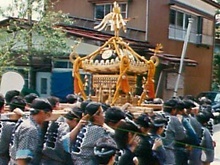 Miyamoto Tokamachi Factory donated a "mikoshi" (portable shrine) for a summer festival held in the neighboring area to contribute to regional development. It has been dedicated to the Yoshida Shrine in Tokamachi. The name of the then-president of Miyamoto has been carved on a stone monument standing in the precincts of the shrine.